Italian wine making enjoys tradition rich in both modern and rustic methods, although much of the country’s wineries now employ scientific and technological tools to create quality wines. The country’s wines are made primarily from two types of grapes, Nebbiolo and Sangiovese. The Nebbiolo grapes are used in the northwestern part of the country, creating the red wines Barolo and Barbaresco. The Sangiovese grapes create one of the better-known Italian wines, Chianti, and are native to the central Tuscany and Umbria regions. Italy’s wines are divided into four categories based on origin, quality, and purity. When shopping for a fine Italian wine, look for those with the designation of “Denominazione di Origine Controllata e Garantita D.O.C.G.,” which is awarded to wines with a solid reputation. This designation considers region, production yields, and a DOC of at least five years. DOC indicates the origins of a wine, the type of grapes used in making the wine, and the methods of production. DOCG is a designation following stricter guidelines than the DOC, which includes a guarantee of origin. The Piedmont region creates a number of DOC and DOCG wines. The Northeast region is home to two of Italy’s wine schools, and generates about a third of the country’s DOC wines. Veneto, one of the regions, now produces the most wine of any region in the country. The tradition of wine making in this region has often been traditional, the region is moving toward more contemporary wine making methods, and the overall quality has improved. Some wine experts believe that this region will continue to make great strides in wine making, so for those who love red wine, this is an area worth watching. 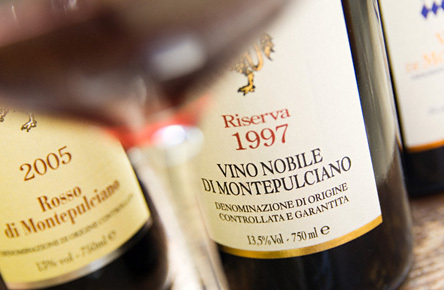 Tuscany creates the well-known Chianti wine, as well as a variety of other Tuscan reds. The Southern region, which includes the islands, is comprised of six regions. The region is focusing on overall quality, and this, too, is a region worth watching. For those interested in consistent quality wines, many of the region’s production offer just that. For those new to Italian wine or wanting additional information, there is an abundance of sources. We, at Wine Embassy, dedicated ourselves to explain and make people discover new wine. Feel free to ask our staff for more information or myself for a private Italian Course.